This article is about the children's book series. For other uses, see Curious George (disambiguation). Curious George is the protagonist of a series of popular children's books by the same name, written by H. A. Rey and Margret Rey with illustrations by Alan J. Shalleck. The books feature a chimp named George, who is brought from his home in Africa by "The Man with The Yellow Hat" as his best friend to live with him in a giant city. The original series was written by the team of Hans Augusto Rey and Margret Rey. The Jewish couple fled Paris in June 1940, on self made bicycles, carrying the Curious George manuscript with them. At first, only H. A. Rey was credited for the work in order to distinguish the Reys' books from the large number of children's books written by female authors. The first seven books were illustrated by H.A. Rey. Later, Alan Shalleck was credited for the illustrations and Hans Rey and Margret Rey for the writing. The Reys produced many other children's books, but the Curious George series was the most popular. Each book has been in continuous print since it was first published. The current United States publisher is Houghton Mifflin Harcourt of Boston, Mass. 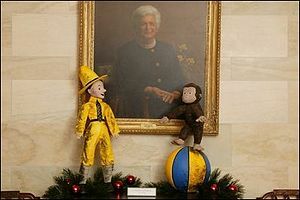 The White House 2003 Christmas decoration using Curious George as the theme with the Barbara Bush portrait. Margret and H. A. Rey released seven "Curious George" books during H. A. Rey's lifetime. Recently, more Curious George books have been released by Houghton Mifflin Harcourt including board books with scenes from the original books, books adapted from the 1980s telefilm series, and new adventures. Curious George appeared in 1941. This book begins with George living in Africa and tells the story of his capture by the Man with the Yellow Hat, who takes him on a ship to "the big city" where he will live in a zoo. The second book, Curious George Takes a Job (1947), begins with George living in the zoo, from which he escapes and has several adventures before the Man with the Yellow Hat finds him and takes George to live at his house. The remaining five stories describe George's adventures while living at the house of the Man with the Yellow Hat. Sometimes dubbed the "Original Adventures", these original seven titles are completely by the series creators, Margret & H. A. Rey. Before appearing in his own series, Curious George appeared as a character in another children's book written and illustrated by H. A. Rey, Cecily G. and the Nine Monkeys (1939). A second series of books, based on the telefilm series, was edited by Margret & H.A. Rey and Alan J. Shalleck. These appeared between 1984 and 1993. They are mostly out of print, though several have been re-released with new cover art. A third series of books, the Curious George "New Adventures," began to appear in 1998, and continues to the present. These books are "illustrated in the style of H. A. Rey" by a variety of credited and uncredited artists including Mary O'Keefe Young, Martha Weston, Anna Grossnickle Hines, Michael Jensen, and Vipah Interactive. The Man with the Yellow Hat. Aside from George himself, the only recurring character in the original adventures is the unnamed Man with the Yellow Hat who is George’s best friend. The Man often facilitates George's adventures by taking him somewhere, and even more often resolves the tension by intervening just in time to get George out of a tight spot. He is always seen wearing a bright yellow suit and a wide brimmed yellow hat. The Man is never mentioned by name in the original adventures or in any subsequent content over more than six decades. He is always referred to as "The Man" or fully "The Man with the Yellow Hat". When people speak to George about the Man, they often refer to him as "Your friend", though the Man is more like a father to George. However, in Curious George (2006), the Man, who is voiced by Will Ferrell, is referred to as "Ted" throughout the film, and his last name is revealed as being "Shackleford" in a deleted scene. There was a series of animated television films made (beginning in 1980) featuring the character, which were then adapted into books themselves (making up part of the New Adventures series listed above). This series was produced and co-written by Alan Shalleck. A series of Curious George animated shorts were aired on The Disney Channel as a segment on the program Lunch Box from the late 1980s into the 1990s. On Playhouse Disney (now Disney Junior), Jack Duffy narrated a 2D animated story version of Curious George which had different episodes from the book series that were written by H.A. Rey and Margret Rey. It was part of a story time segment called Circle Time which aired on television between 1997 and 2001. A new Curious George series debuted on September 4, 2006, on PBS Kids as part of the PBS Kids Preschool Block. Although Curious George ended its original run on April 1, 2015, the series was still airing on PBS Kids through reruns. It is produced by the Boston affiliate WGBH, Imagine Entertainment, and Universal Animation Studios. In 2017 a documentary was released about the inspiration from the author's lives that created Curious George, their flee from the Nazis, subsequent taking up residence in the US, and ultimate fame from the popular character. Monkey Business: The Adventures of Curious George's Creators. Directed by Ema Ryan Yamazaki. A minimal-animation 16 mm film called Curious George Rides a Bike was produced by Weston Woods Studios in 1958 and later released on DVD. 16 mm stop-motion animated shorts were produced of two Curious George stories, Curious George and Curious George Goes to the Hospital in 1982, created with puppet-figures by noted animator John Clark Matthews (who later used a similar technique for his films of Frog and Toad). An animated film, Curious George, featuring Will Ferrell as the voice of the originally unnamed Man With the Yellow Hat, was released on February 10, 2006. In this film (in which The Man is referred to as "Ted"), Curious George secretly follows The Man onto the ship to the city on his own accord. Frank Welker provided the vocal effects of Curious George. On March 2, 2010, a direct to video sequel to the film was released, titled Curious George 2: Follow That Monkey!, which featured Jeff Bennett replacing Ferrell as the voice of the Man. Bennett also provides the Man's voice in the television series. The second direct to video sequel, Curious George 3: Back to the Jungle, was released on June 23, 2015. A Christmas film, Curious George: A Very Monkey Christmas, was released in 2009 on PBS. "Curious George Swings Into Spring" and "Curious George: A Halloween Boo Fest" were released in 2013. On Monday, August 6, it began to re-run on Cartoonito. A live action/computer animated film was in development at Illumination Entertainment in the beginning of the 2010s. In August 2016, it was reported that Andrew Adamson was in negotiations to direct, co-write, and executive produce a live action film for Universal Pictures, along with Ron Howard, Brian Grazer, David Kirschner, Jon Shapiro and Erica Huggins producing. There is also a Curious George video game that was released on February 2, 2006, published by Namco and developed by Monkey Bar Games, a division of Vicious Cycle Software for Microsoft Windows, Xbox, GameCube, PlayStation 2, and Game Boy Advance. A version for the Nintendo DS was also planned, but was cancelled. A children's bookstore in Harvard Square, Cambridge, Massachusetts, was known as Curious George and Friends (formerly Curious George Goes To Wordsworth), and carried a considerable amount of licensed Curious George merchandise. It was the last remaining property of Wordsworth Books, a former local general interest bookstore that closed in the beginning of the 2000s. This store was closed in June 2011. A new store opened in 2012 at the same address, called The World's Only Curious George Store, Harvard Square. VEE Corporation, the company behind Sesame Street Live, is mounting Curious George Live. It is a brand new national tour featuring song and dance and Curious George himself. It is based on the PBS animated series. Curious George is used as the theme for children's play areas and some of the children's entertainment on the Stena Line ferries. On some peak time sailings this includes a Curious George costumed character. Curious George merchandise is also provided with children's meals and is available to purchase in the on-board shop. A Curious George themed water play area, called Curious George Goes to Town, has been a minor attraction at Universal Studios Florida since 1998. The attraction also featured at Universal Studios Hollywood until its removal in 2013. In February 2006, the Curious George brand joined with Welch's jelly for a collectible of six jars. In the latter part of that decade (when the new film and the new television show were released), licensing deals for the character generally involved less upscale, more kid-focused products. Earlier, Vivendi Universal (now NBCUniversal) had, for a short time, embraced the use of the character in a series of 2001 adverts for the company (but the character never officially became a corporate mascot). In the film Forrest Gump of 1994, one edition of Curious George (one with a yellow cover but no other title than Curious George) is used as Forrest's favorite book, which his mother reads to him. In the opening scene a feather comes floating down to Forrest's feet and he stores it in this book. At the end of the film it falls out of the book and rises floating through the air again. Jarrod, the titular character and protagonist from the NBC series The Pretender, read Curious George books in Season One and developed a fascination with them. He likened himself to George and Sydney Green, the psychiatrist whom he saw as a surrogate father, to the Man with the Yellow Hat. The books have inspired others, for example Bangkok Bob, written for and published by Big Brother Mouse, a Lao publishing project. ^ a b "Curious George . About the Reys". Retrieved 2008-03-10. ^ "Boston.com News, By Mark Feeney Globe Staff". The Boston Globe. September 17, 2005. Retrieved 2007-10-29. ^ "New York Times, By Dinitia Smith". The New York Times. September 13, 2005. Retrieved 2007-10-29. ^ Marcus, Leonard S. "Introduction" in The Complete Curious George. New York: Houghton Mifflin Company, 2001. ^ The Disney Channel Magazine, Vol. 7, no. 5, September/October 1989: p. 41. ^ The Disney Channel Magazine, Vol. 9, no. 6, November/December 1991: p. 34. ^ Biederman, Donald E.; Pierson, Edward P.; Biederman, Charles J.; Silfen, Martin E. (10 May 2018). "Law and Business of the Entertainment Industries". Greenwood Publishing Group – via Google Books. ^ "Monkey Business: The Adventures of Curious George's Creators". IMDB. Yamazaki. 2017. Retrieved 23 December 2018. ^ "The Adventures of Curious George" – via www.imdb.com. ^ "Curious George 3: Back to the Jungle". Universal Studios Home Entertainment. Retrieved May 7, 2015. ^ Zeitchik, Steven (July 30, 2010). "With 'Curious George,' Illumination looks to make more animation mischief". Los Angeles Times. Retrieved July 31, 2010. ^ Debruge, Peter (November 17, 2015). "'Minions' and Illumination Create a Blockbuster Animation Unit for Universal". Variety. Retrieved November 20, 2015. ^ Fleming, Jr, Mike (August 8, 2016). "Andrew Adamson To Direct Live-Action 'Curious George' For Universal". Deadline. ^ Melamed, Ariana. "The Curious Monkey that Kids Gotta Love" (in Hebrew). Retrieved 3 January 2016. 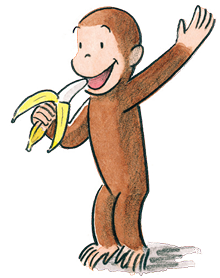 Wikimedia Commons has media related to Curious George. This page was last edited on 17 April 2019, at 20:12 (UTC).